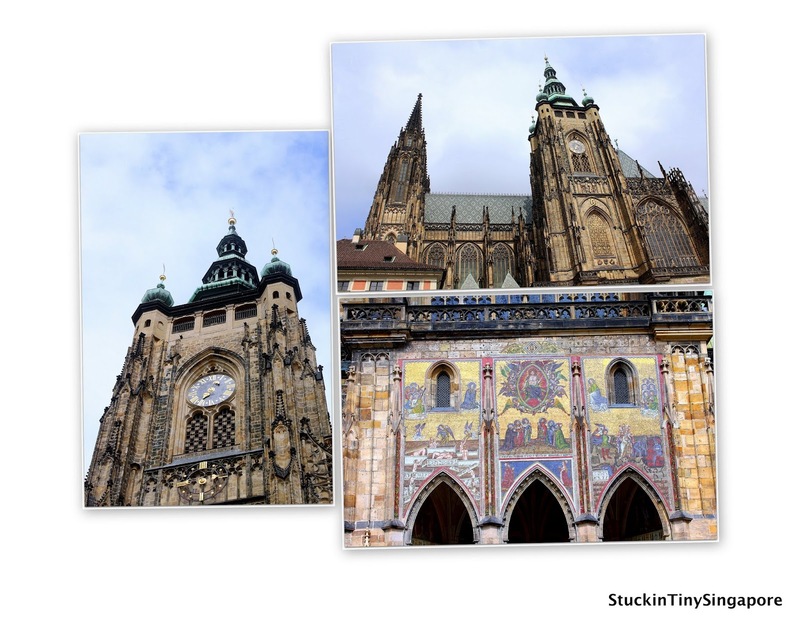 We started our second day in Prague visiting the Prague Castle. Be warned that this will be a photo heavy blog post. From our hotel, we took a tram over the river towards the Prague Castle and met our tour guide Alena for our second day with her. 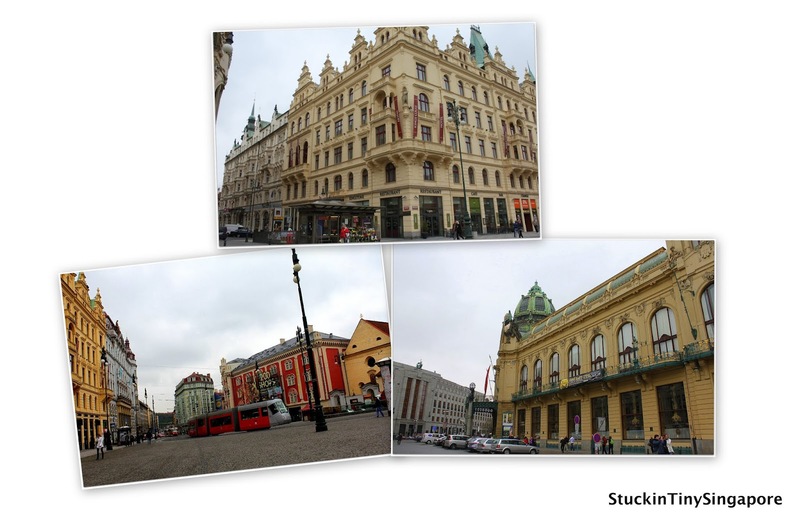 On our way, we saw many beautiful buildings. 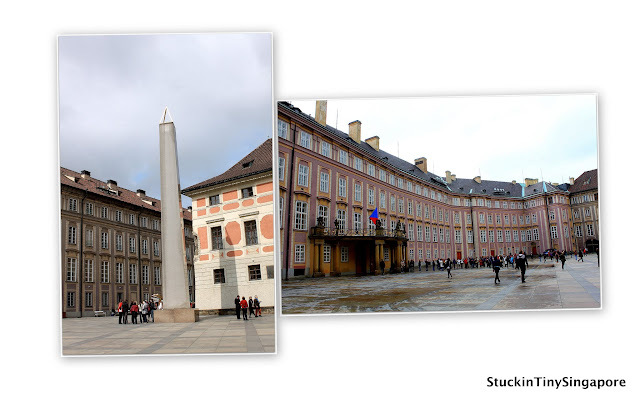 I love Europe for their cobblestone streets and wonderful architecture and there is plenty of that in Prague. From the tram station, it was a nice little walk up the hill towards the castle. This gave us a nice view of Prague from above. 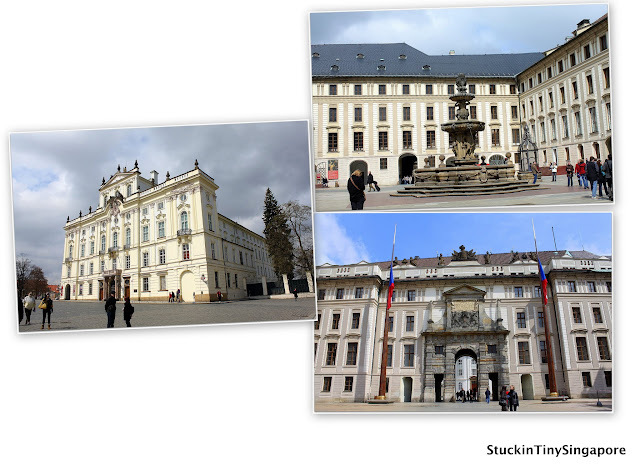 Alena was explaining to us that the castle is the largest in the world on an area of over 7 hectares. What makes the castle interesting is its eclectic mixture of architectural styles, ranging from 10th Century Roman-style to 14th Century Gothic style. 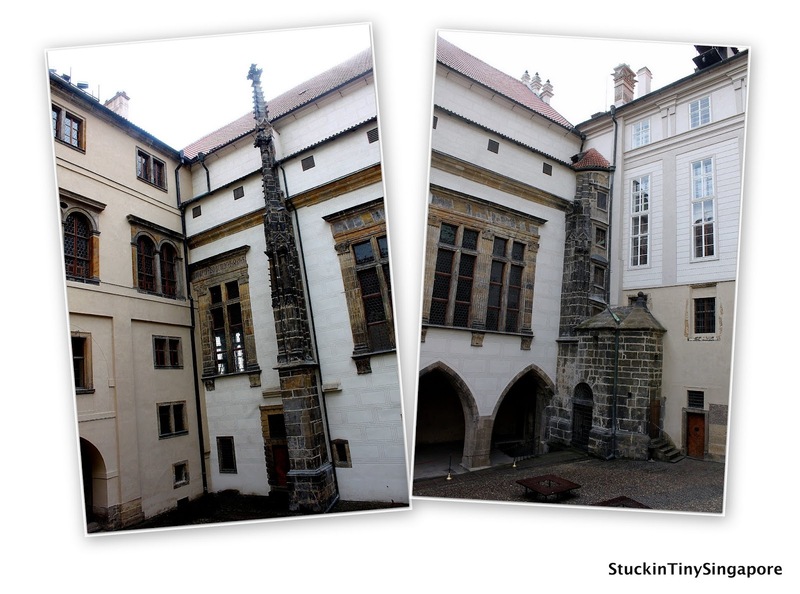 Due to the history of destructive wars, fires and renovation, the Prague Castle complex consists of three courtyards, buildings, the Saint Vitus Cathedral, palaces and towers. There are also many museums and art galleries. One can easily spend a whole day exploring the entire compound. St Vitus Cathedral is one of the main attraction in the Castle compound and queues can be very long during peak season. Luckily for us, the queue into the Cathedral was not long. So Alena took us in to take a look. It was amazing inside. 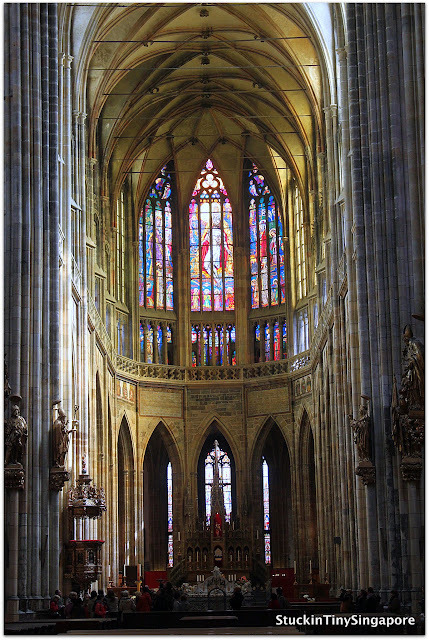 It is the largest and most important church in Prague and contains tombs of many Bohemian Kings and Holy Roman Emperors to sovereigns, noblemen and archbishops. 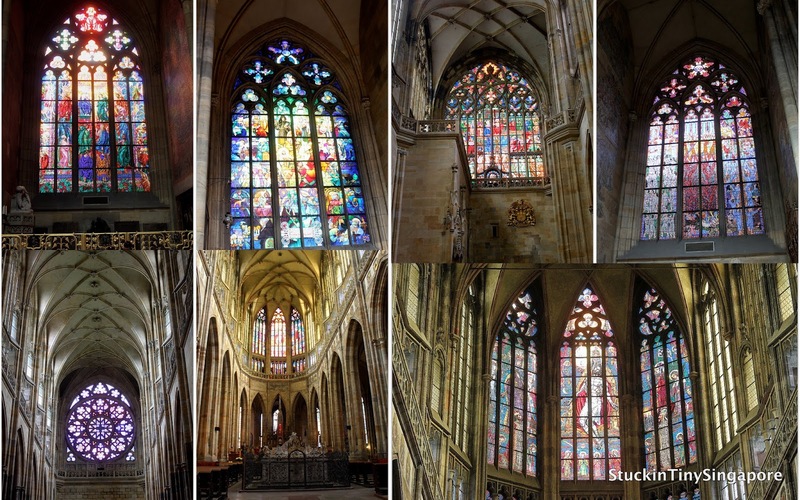 The first stone of the cathedral was laid in the year 1344 during the reign of Charles IV who was the favourite Czech King. It is also an extremely excellent example of Gothic architecture. The external facade of the cathedral is fascinating. Even though the first stone was laid in 1344, the whole building was half built through the Renaissance and Baroque era, repaired in the 19th Century and only was finished in the 20th Century. The Golden Gate of the Cathedral is the southern entrance to St Vitus. It is decorated using colourful gilded mosaic showing the Last Judgement from the 14th Century. The work dates back to the 1370s where it was made of one million pieces of mosaics. The last judgement depicts Christ in the middle, being adored and worshipped by Charles IV, his wife and several saints. 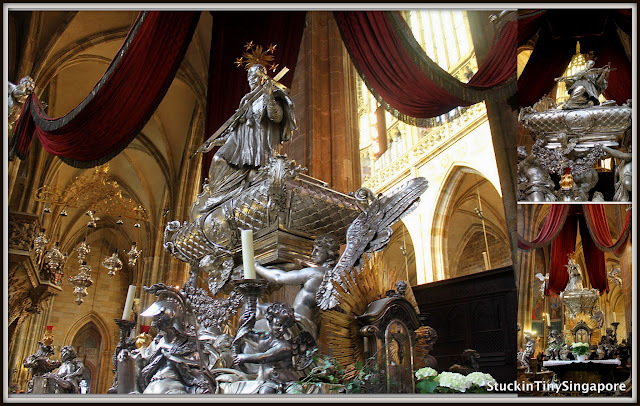 The picture on the right depicts Satan surrounded by hellfire, while on the left, it showed the risen dead and angels. 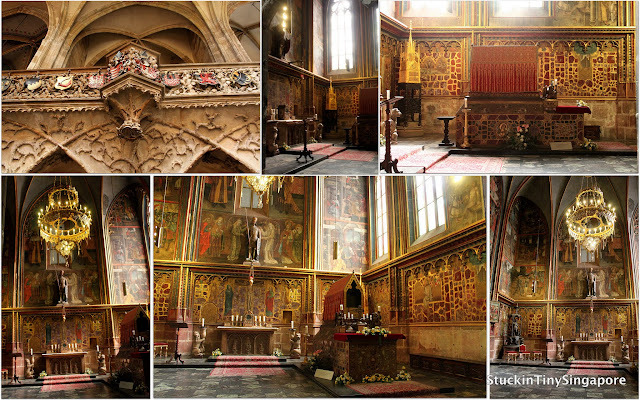 Inside the cathedral, the most notable and outstanding Chapel is the Chapel of St. Wenceslas. Here is where the relics of the saint is kept. It has a ribbed vault with the lower part of the walls decorated lavishly with over 1300 semi-precious stones and paintings about the Passion of Christ dating from the 14th Century. The upper walls have paintings about the life of St. Wenceslas and in the middle of the wall is a Gothic Statue of St Wenceslas. There is a small door with seven locks, in the south-western corner of the chapel that leads to the Crown Chamber which is only on display to the public every eight years. 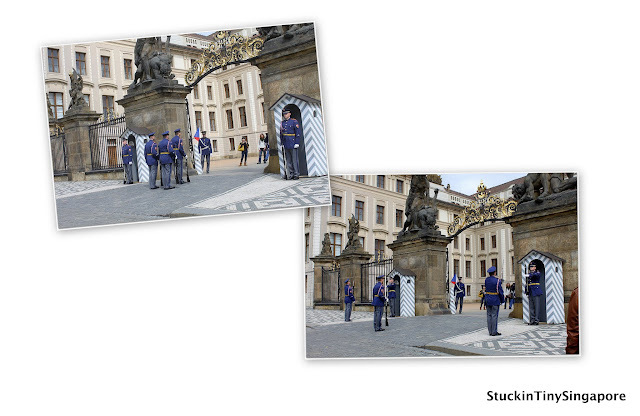 The seven keys to the seven locks are held by different people, one of whom is the president of the Czech republic. After the visit to the Cathedral, we walked a bit more within the compound and came across to the front entrance of the Castle. The entrance gate has a Rococco gate and monoumental statues of fighting giants where below stands the Castle guards. Another noteworthy place within the castle to visit is the Golden Lane. Though somehow I could not find any photos of it but I remembered that we visited it. Guess maybe that is an excuse for revisiting Prague? :) Thanks for the reading the long post, I will be back with the last part to our Prague adventure. Stay Tune. 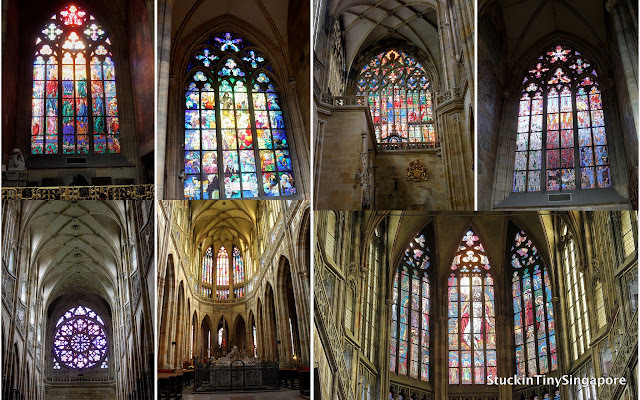 What do you like most in prague? Can you reccomend us something?